Bathware industry leader, Aquatic, will showcase two of its most popular hydrotherapy tubs in the Show Village exhibit at the 2012 International Builders’ Show. Aquatic’s Serenity 11 and Cooper 32 will grace the bathrooms in the “Cape Cod” house. The Serenity and Cooper series are part of Aquatic’s hydrotherapy line which recently underwent a year-long refreshing to create even more beautiful, and better-performing tubs. IBS’s Show Village provides a great opportunity for people to see Aquatic products in a real house with spectacular bathrooms that reflect the most current and inspirational lifestyle and design trends. Aquatic – the world leader in innovative and inspirational bathware – today announced plans to showcase two of its most popular hydrotherapy tubs in the Show Village exhibit at the 2012 International Builders’ Show (IBS), February 8-11, at the Orange County Convention Center in Orlando, Florida. Aquatic's Serenity 11 and Cooper 32 will grace the master and secondary bathrooms in Show Village’s “Cape Cod” house, provided by Nationwide Homes (a subsidiary of Palm Harbor Homes, one of the largest U.S. marketers of high-end, factory-built houses). The Serenity and Cooper series are part of Aquatic's Hydrotherapy line which recently underwent a year-long refreshing to create even more beautiful, and better-performing tubs. Additionally, the Cape Cod’s laundry room will showcase Aquatic’s award-winning Delicair I, an extraordinary utility sink with an air bath system. Sponsored by Professional Builder magazine, Show Village consists of several houses built at IBS annually to the highest standards of construction and design excellence. Always a major attraction for show attendees, the outdoor exhibit lets builders and designers see the best products available today in an installed environment. Always a favorite of builders, the Cape Cod house is a classic and charming design that uses space efficiently. Designers at Nationwide describe the 3,100 square-foot, three-bedroom home as "a new take on the vintage American farmhouse, recapturing '50s comfort and casual family lifestyle.” The master bath will feature Aquatic’s freestanding Serenity 11 tub in Cashmere and Biscuit (exterior and interior, respectively) – a stunning piece that has inspired design elements throughout the master suite. The bathroom flooring, tiles and quartz particulate counter tops pick up on the tub colors while a fresh, green glass, leaf-shaped vessel sink adds vibrant contrast. The tub’s elliptical shape works well with the soft lines of the house, adding romance to the space and inviting bathers to take a break from today’s hectic world. 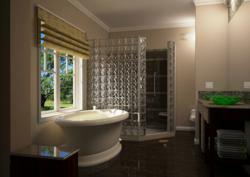 Serenity 11 can be configured as an air bath or soaker. Similarly, Aquatic’s Cooper 32 in White is the focal point for the house’s 6’ x 12’ guest bathroom. Available as a soaker or whirlpool that fits standard bath alcoves, this skirted tub is a minimalist, geometric design that creates a clean and uncluttered look. It has a post-modern, contemporary feel and ability to make a grand statement, despite a small footprint. To keep focus on the striking tub, the rest of the bathroom will be simple and linear including, for example, 4” x 12” Biscuit-colored tile to create an elongated effect. Show Village visitors also won’t want to miss the ultimate laundry room amenity – Aquatic’s award-winning Delicair utility basin. Popular for custom homes and luxury remodels, Delicair is ideal for delicate clothing that requires hand washing and even for small pet care. Two of the series’ three models include an air bath system based on the same outstanding technology that Aquatic puts in many of its hydrotherapy tubs. The Delicair I model planned for the Cape Cod house features an automatic purge cycle that starts 20 minutes after use, eliminating all water from the unit’s plumbing to ensure years of maintenance-free and hygienic operation. Delicair is available in two colors – White or Biscuit.